We know it tastes good but there’s actually a few other reasons to fall in love all over again with our good friend chocolate. one: chocolate is good for your heart (and on valentines day this is super important!) It’s the magnesium in the chocolate that helps our muscles recover and develop (remember, heart = muscle). three: chocolate reduces stress. The swiss (how ironic!) found that when very anxious people ate a small amount of dark chocolate every day for two weeks, their stress hormone levels reduced! Tick! four: chocolate makes you happy! Wow, this IS a super food. Studies have shown that people who are generally happy have a lot of anandamide in their system…and guess what?! Anandamide can be found in chocolate! five: did we mention chocolate tastes delish…oh, we did…this reason definitely deserves a second mention! So this valentines day get a little creative in the kitchen and try these super easy, super tasty paleo chocolate truffles, sure to melt someone’s heart! * merrymaker disclaimer!! This is an old recipe, we no longer eat dark chocolate with any form of sugar!! Check out our paleo chocolate recipe for a 100% paleo version!! YUUUUMMMMMMM!!!!!! Place mini patty cases into mini muffin moulds (this assists in keeping the chocolate's shape). Chop the chocolate finely and place in a bowl. Heat the coconut milk on medium heat until it just starts to bubble. Pour the coconut milk over the chocolate and stir slowly until all of the chocolate is melted and combined with the milk. Fill mini patty cases three quarters full with the chocolate mix. Sprinkle desired fillings onto the chocolates and mix carefully with a toothpick. Place in the fridge for one hour, or until ready to serve. If you don't eat them all in the first sitting (we did...oops?) keep in the fridge for up to one week...yeah right! 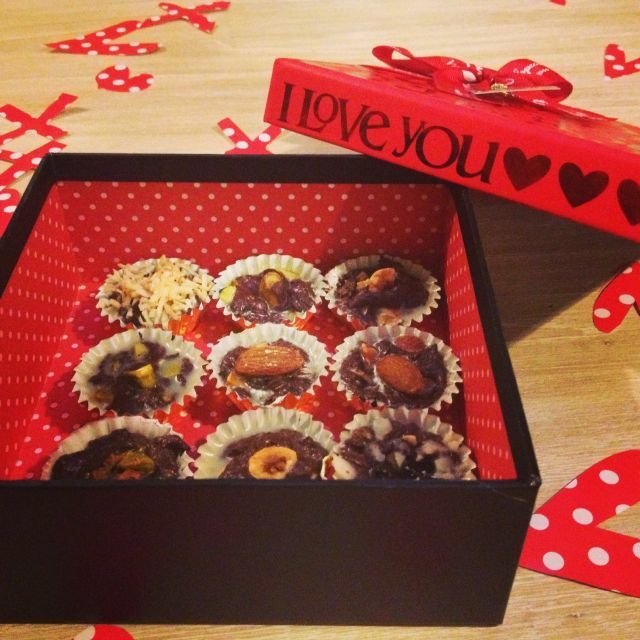 Perfect to share with your loved one...one for them and the rest for you!